Saturday was the start of my annual ‘Southern Utah Wanderings’ trip that I usually go on in October. This year is a little different since I wanted to venture a little further south so that I could start exploring the Arizona Strip. Like last year, my friend Jared joined me on this trip. He headed down from the Salt Lake area after work on Friday and stayed at my house over night so that we could get an early start driving on Saturday morning. Saturday would mostly be a driving day, but we did manage to make a few stops along the way. The first of them being a short side trip to the Parowan Gap. 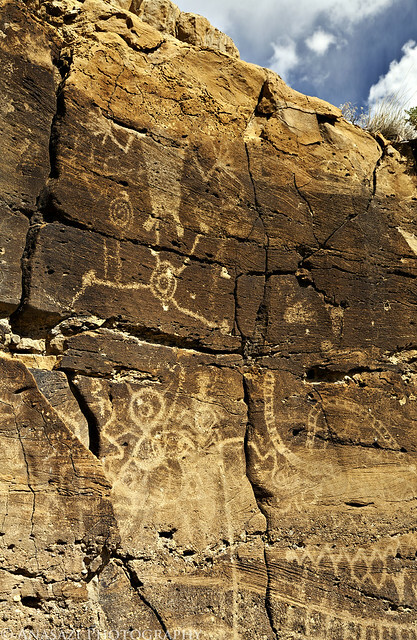 The Parowan Gap is one of Utah’s best-known petroglyph sites, which is located in a 600-foot-deep notch through the Red Hills on the eastern edge of the Escalante Desert. I’ve been looking forward to visiting this site for some time. 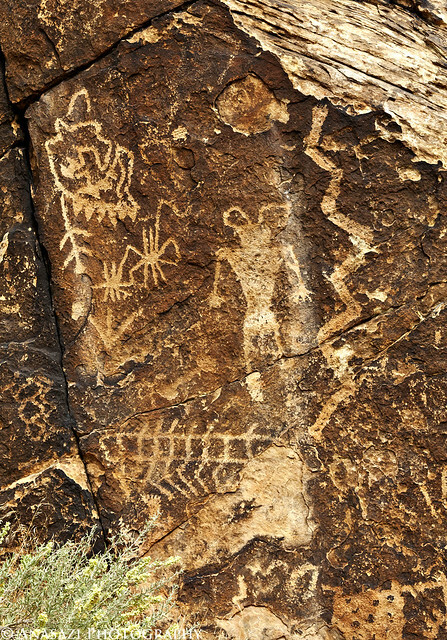 The ‘Zipper-Glyph’ is probably the most well known petroglyph panel at the site. Some believe the main design that resembles a zipper is a map or a calendar….or maybe even both. 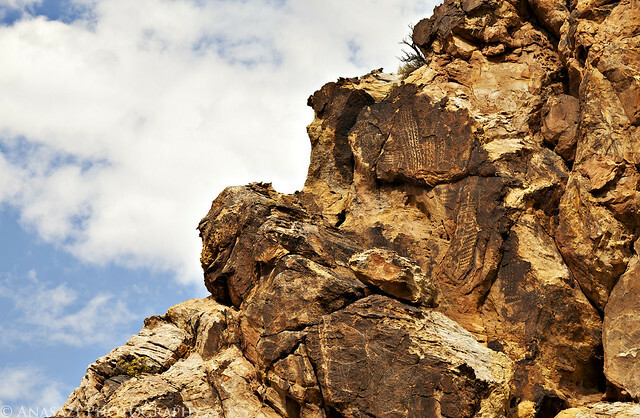 All I know is that it is shaped just like the Parowan Gap that it is located near. 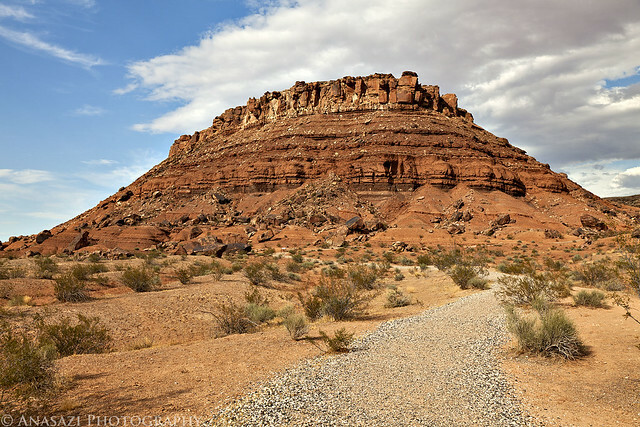 We walked through the gap keeping a lookout for petroglyphs along the way. 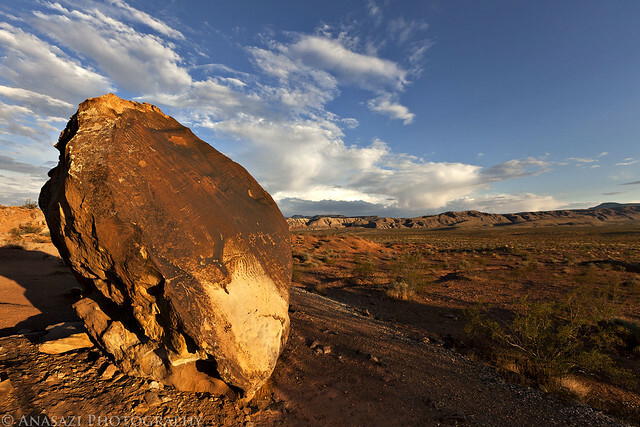 When we reached the west side, this is the last boulder we found containing some petroglyphs. 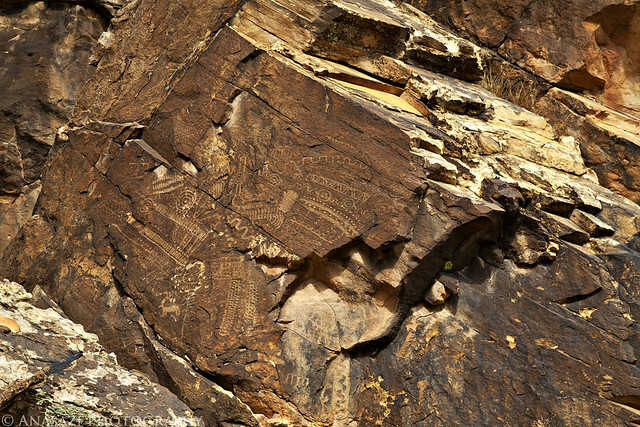 Jared spotted these designs that were carved high up near the west side of the gap. I’m glad I had grabbed my long lens when I left the Jeep. 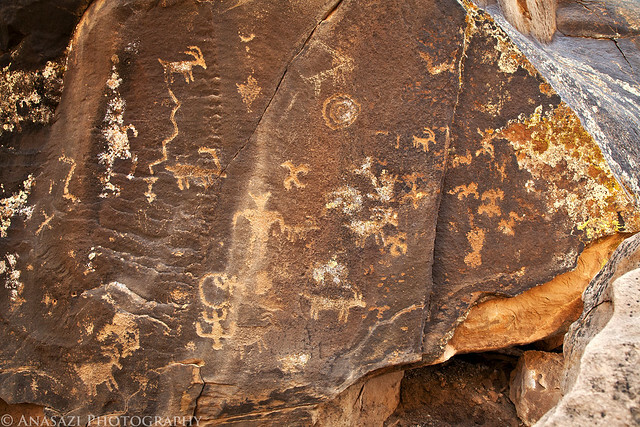 We found plenty of petroglyphs on the south side of the gap as well, including some in this small alcove. There were plenty of designs carved into the sandstone like this. These looked like they were pretty old compared to some of the others found in the area. Here’s an overall view of the ‘Zipper-Glyph’ and surrounding panels in their setting so you can get an idea of the location. Before leaving the site, I thought it might be a good idea to get a photo of the actual Parowan Gap. The Jeep wasn’t necessary, but I think it adds to the scene. 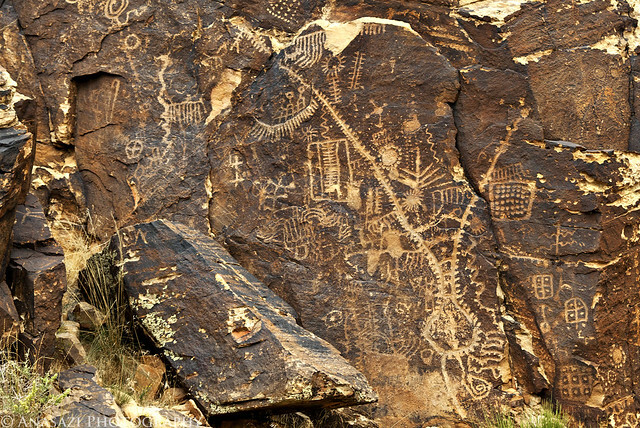 On our drive to the Parowan Gap, Jared though he had spotted some petroglyphs along the road so we investigated on the way back to the highway. It turns out he was right, so we hiked up to them and took a few photos. This is the main panel with the Little Salt Lake in the background. 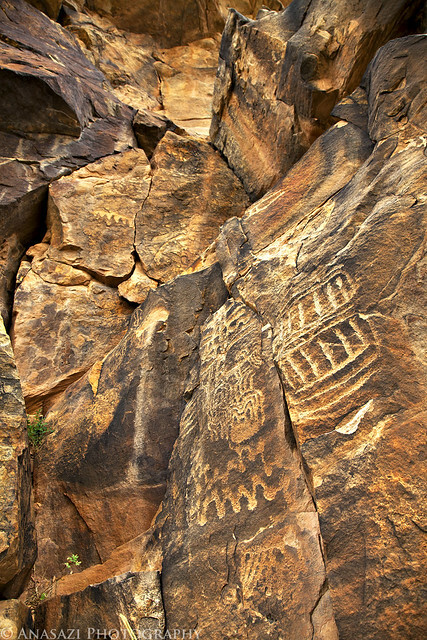 A closer look at some of the petroglyphs found on the above panel. 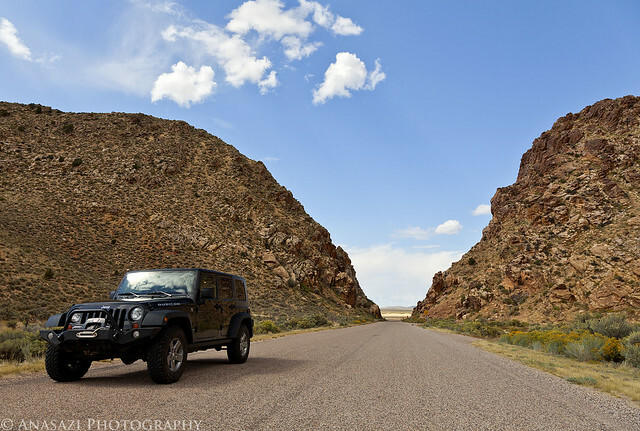 After exploring the Parowan Gap area extensively, we were back on the interstate again headed south. Of course, we had to make the stop in Washington at In-N-Out for a Double Double for dinner. Once our appetites were satisfied we continued down into Arizona just over the border so that we could visit the Little Black Mountain petroglyph site. 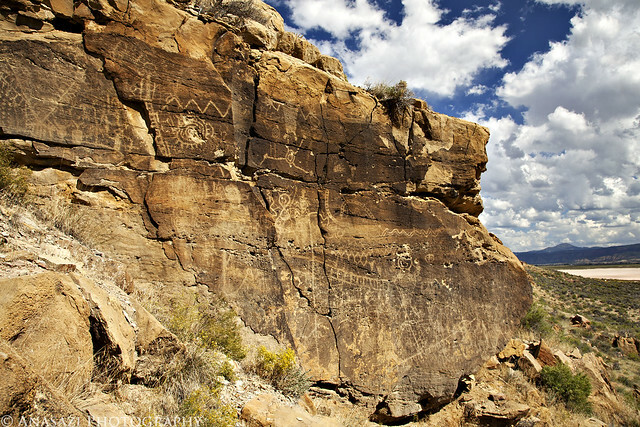 Apparently there are forty-four boulders located here that contain more than 500 petroglyphs. I’m pretty sure that we didn’t find them all, but we did find many of them. 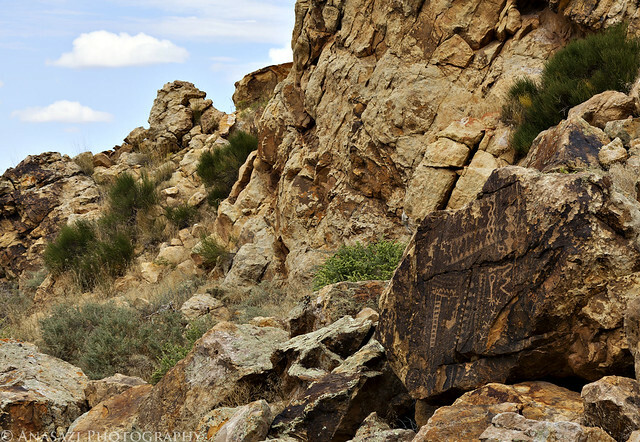 This was one of the more unique petroglyph settings at the site. 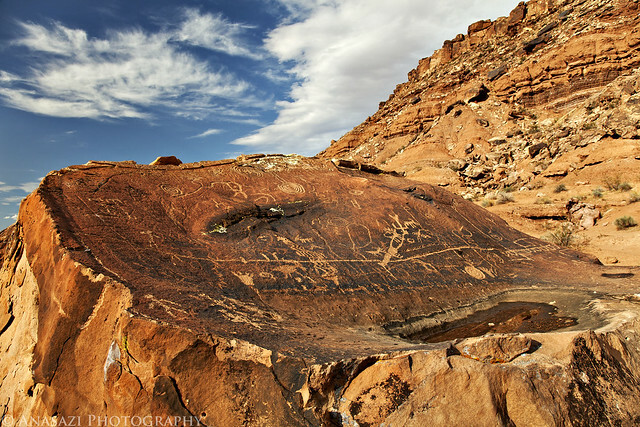 The petroglyphs found here are carved on top of this large boulder. It looks like there is a natural pothole on top that holds water, which might be the reason this was an important place here in the desert. Jared testing out the swivel screen on his new camera body which also helps give this site a little scale. 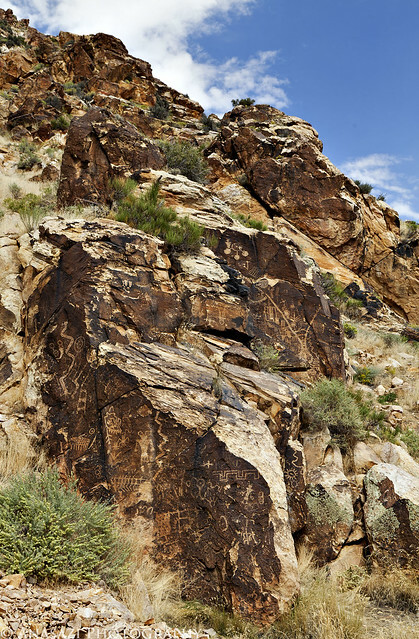 Looking up at a smooth surface on a boulder containing more petroglyphs. This panel was located on the back of a large boulder. 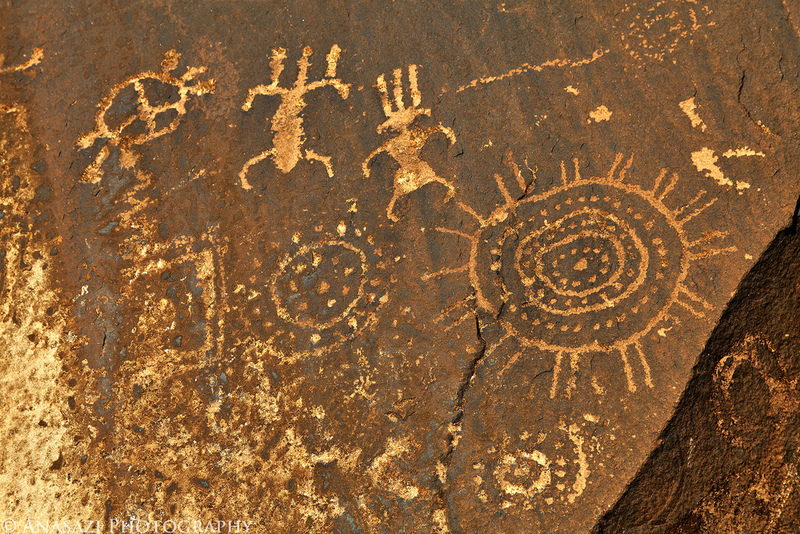 This sun figure was one of the more elaborate petroglyphs found here. 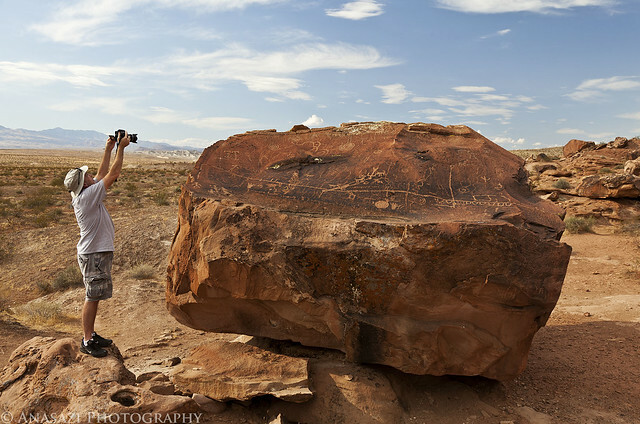 A look at the large boulder containing the previous petroglyphs. 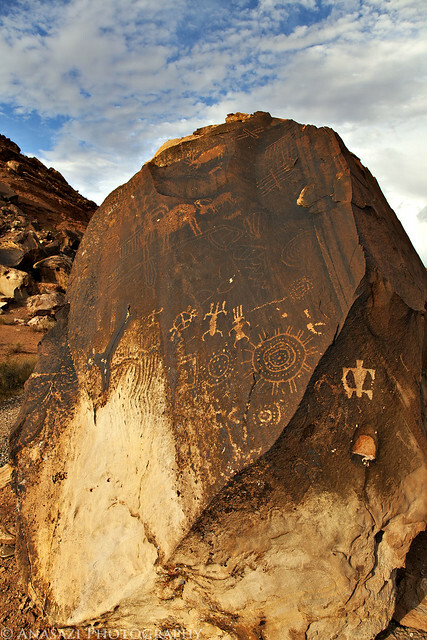 If you look closely you can see plenty of older petroglyphs carved into the boulder with plenty of newer ones, too. This location was probably used for a long time. 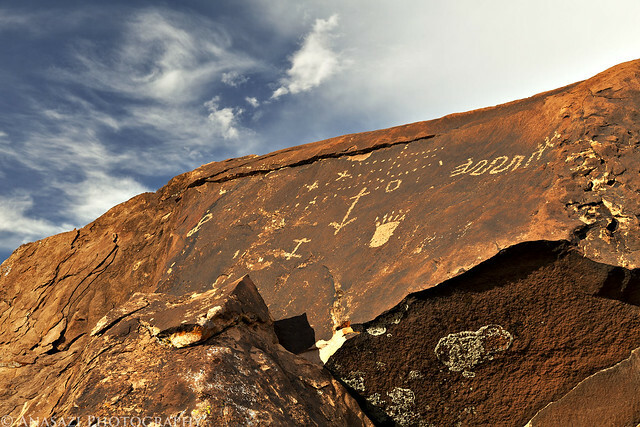 A few faint and simple petroglyphs on a boulder that frames the landscape in the background nicely. 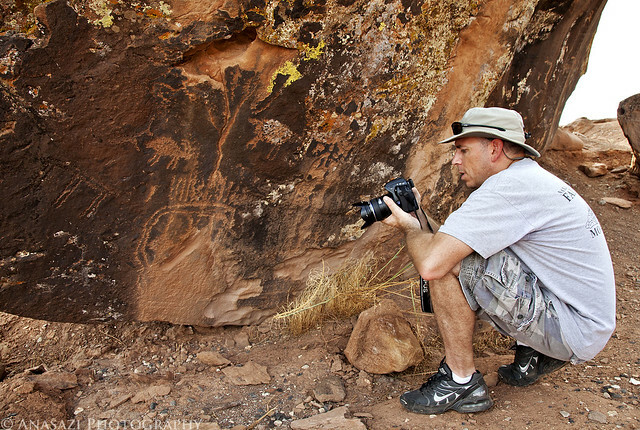 Jared photographing some petroglyphs located near ground level on a large boulder. 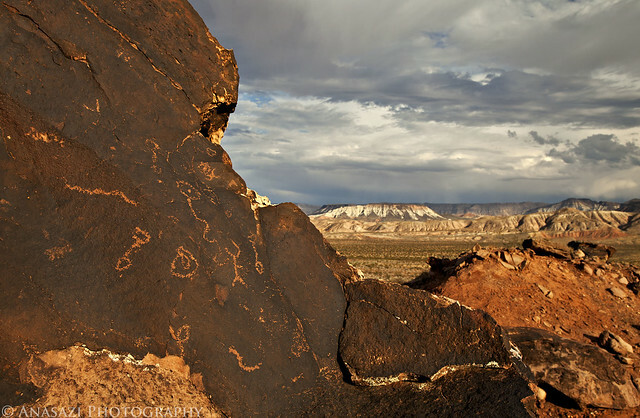 After searching for petroglyphs at the base of Little Black Mountain for a while, it was starting to get late. We decided to setup camp nearby and then headed back over to get some sunset photos. 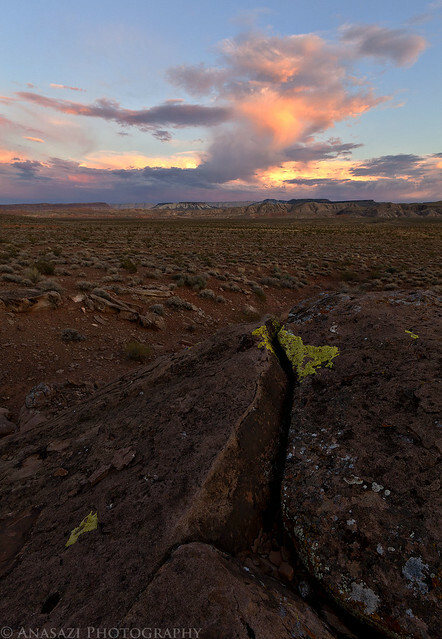 Here’s the large boulder containing a bunch of petroglyphs lit of by the setting sun with a few nice clouds in the background. 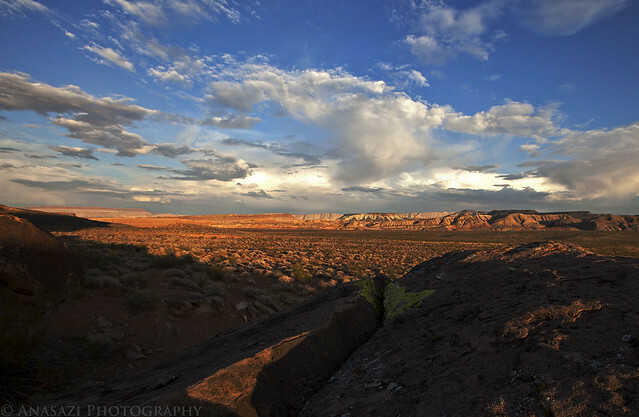 A view over Dutchman Wash as the landscape is bathed in the last sunlight of the day. The clouds even got a little color as the sun dipped below the horizon. It was a great start to the trip. Once the sun was down and the colors in the sky gone we hiked back over to camp so we could get some sleep. The weather was perfect. I ended up sleeping with my tent opened up so that I could have a great view of the night sky. I wish I had tried to take some night photos, but I figured that I would have plenty of other opportunities on the trip….I would be wrong.